I got whits contest prize in the mail!!! she hooked it up!! THANK YOU SO MUCH WHIT!!!! you are such a sweet sweet beautiful BABE!! hehe well, you deserve it ! what a great prize. i looove the kitkats, yummmy! cant wait to hear what your contest will be. I'm so curious about your contest too! Can't wait! Oh, you won the contest! Congratulations! What a great prize! what a prize pack! i can't wait to see what you come up for your contest! OOHH how sweet of her!! OH i see some candy!!YUMMY! omg she really DID hook you up!!! I cannot wait for your contest! 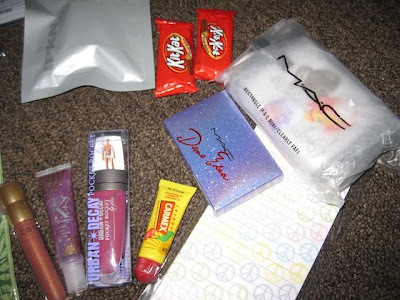 That is such a sweet prize pack! 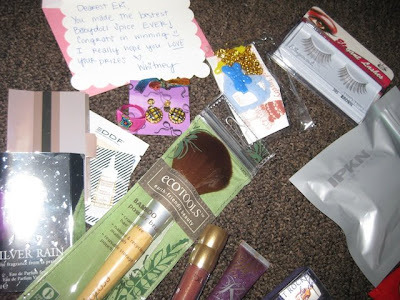 Fafi bag, EcoTools, Esty jewelry, Dame Edna, and samples, glosses, & sweets!! Wow! mMmm kit kats my favorite!!!!!!! I SPY AN ECOTOOLS BRUSH!!!! congrats!! prizes looks awesome.. you deserved it, your look was beautiful!! Aw what great prizes!! Congrats, hehehe. 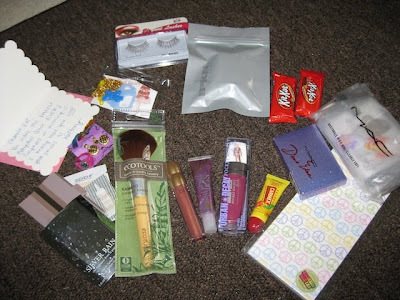 wow, that's an awesome prize to get in the mail :) can't wait to see what your contest will be! wow..nice prizes you got there ..you deserve it! btw, you're so pretty! Congrats on the contest win!! :) Your look was super cute! What great prizes!! She did hook u up!! especially from going onto blogger! wow those are some nice prizes that you've added. congrats on the contest again =) i hope to you do a look with the prizes! I got a new blog; the last one got deleted by accident . Hope to see you follow me soon.